Meredith H. Willett, owner of M's Canvashouse and the Elizabeth Turner Collection, just announced she is renaming Elizabeth Turner Collection. It will now be known as the Meredith Collection! © Copyright December 31, 2015 Jane M. Wood. All rights reserved. Regular readers of Blog will remember I asked back in October what folks like to read here. I'm making an attempt to cut down on the various chores I do each day so that I'll have more stitching time. I asked for input and an amazing number of you revealed how you use Blog and what you think is important for me to keep. Thank you! Daily updates, which tend to be news from blogs, websites, and Facebook. That's the bulk of Blog postings these days. Folks suggested I cut back to 3 times a week instead of a daily posting. I may do that as blog news continues to dry up elsewhere but it doesn't save me time to do so. I still have to read all the postings and pick the ones that are worth repeating. That is what takes the time, not my creating links and brief descriptions. I am just going to try to be more discriminating. More and more things are published on Facebook only, which bothers me since some folks don't like or use social media, but there's nothing I can do about it except hope you non-FB folk can see at least some of the links. Informational tabs, which list things such as Monthly Clubs, Classes and Events, new items from the latest trade show, etc. These are more reference material items. I'm going to stop updating the listings of classes and events. Although people use them, they are a lot of work to keep up to date. I'll leave the list of counted thread designers, list of tutorials, etc. alone for now. The bulk of the work is already done on these. I have combined the list of shops that service non-U.S. customers with the list of favorite shops already and will stop updating the Tutorials and Tips tab as folks rarely use it. I'll still keep a list of new items coming out as the shops who don't go to a trade show use these and regular stitchers also look at this a lot. It's some work to do but that is more manageable than other areas. Blog-stitching is the most popular thing I do. Folks love watching me stitch things and listen to my explanations of what I've done and why. That's the most popular part of Blog, actually. I hope to do more of this in 2016, since I've stopped doing models and writing custom stitch guides. I simply don't have the time with Real Life chores and the grind of constant deadlines is getting to me. I may do a model here and there, but I won't be stitching 4-6 a year any more. I will still do guides, but for canvases that I own, love and want to stitch. Many of those will be blog-stitched although folks who want all the information on how to reproduce what I did in one compact piece will be able to purchase a guide. So, that's The Plan for 2016. I hope it frees up more time in my busy day to stitch. Happy New Year! © Copyright October 26, 2015 Jane M. Wood. All rights reserved. Can't Find That Perfect Color? Lorraine at Colour Complements showed off two stocking cuffs stitched by a customer today. (Click on the thumbnail photo, then click again on the new photo for a really good look at these cuties.) They are darling, but the point I want to emphasize is that Lorraine custom-dyed a color to create the perfect background thread for the stitcher. The next time you are going nuts trying to find a color to match your canvas, small businesses like Colour Complements might be able to create just the right color in the right thread for you. Of course you can use a different color or pick a light coverage stitch in a medium shade of the background color to show off the color you can't match, but light coverage stitches don't work in every situation. If you can loan out the canvases or find a DMC color match to the thread manufacturer, they might be able to reproduce just the right thing for you. It doesn't hurt to ask! © Copyright December 21, 2015 Jane M. Wood. All rights reserved. Yesterday we talked about padding parts of the Miami Gold Digger's dog, then stitching over those areas, finishing up with my struggles to make the dog's mouth look good. The photo above is my original sketch showing the ways in which I thought my stem stitches should curve to mimic fur realistically. And here is how the dog looks once I finished the eyes, nose and mouth. Look carefully at the dog's ears and you will see there is a line of tent stitches on either side of the face and under the mouth to create a chin. I liked the chin but the tent stitches on the side of the face had to go. With needle painting, mistakes are easy--you just cover them with more stitches! So I added more stem stitches flowing from the head to the ear tips, covering the tent stitches I didn't want. Here is what the dog face looked like after I finished. You can see how the ear tent stitches are covered. No one knows they are there except you and me! I have to admit I worked hard on the chest to get the slant of the stem stitches right. That was the hardest part of the dog for me. But I worked this a little at a time by taking my four plies of Silk/Cashmere and splitting them further into eight sections. You have to be careful doing this as the thread will separate if you pull too hard--it's not really meant to be separated into 8 plies. But doing so enabled me to cover just a little at a time as I tried to get the chest area right. I could have also used one ply of silk floss as well if I wanted just a touch of coverage. That also works without looking too different than the Silk/Cashmere used for the fur. Finally I ended up with a dog that looks like this--I hope you like him and that my struggles and planning show you how to proceed with needle painting. It just takes a little planning, some careful observation when things go wrong to figure out how to fix them, and then layers of new stitches on top to hide your mistakes. In fact, it is really not that hard once you understand how it is done. I hope you'll give needle painting a try. © Copyright December 24, 2015 Jane M. Wood. All rights reserved. Just in time for winter, Needlepoint For Fun has a great snowy skies stitch. If you aren't familiar with the stitch, Pat Timpanaro has done a lovely numbered diagram for the ANG website. 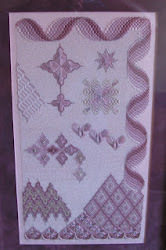 I am not certain what threads Needlepoint For Fun used but it looks like Caron's Snow to me. I happen to love that thread! Of course Silk Lame Braid, Kreinik metallics and a lot of other threads will also work. Raid your stash and see what you can find. Here's to beautiful icy snowy skies this winter--but only on our stitching! © Copyright December 13, 2015 Jane M. Wood. All rights reserved. 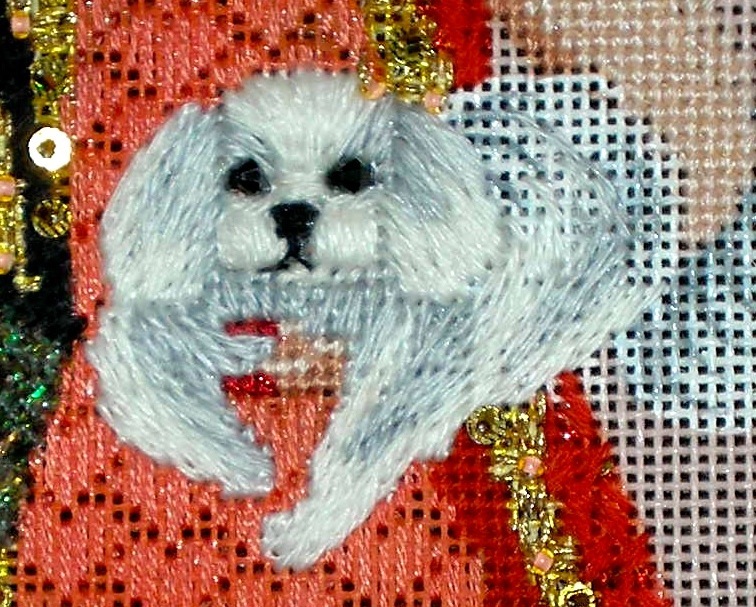 Once I had a sketch plan for how to stitch my little dog (above), it was time to do the stitching. 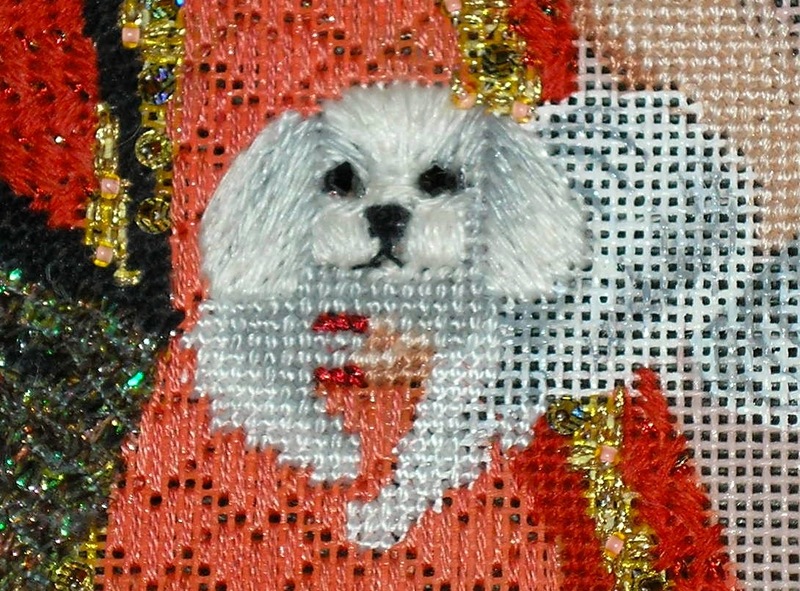 As a reminder, this is an 18 count canvas and I used white size 8 perle cotton and two colors of Gloriana's new Silk/Cashmere thread (using two plies of the four the thread automatically separates into) for the majority of the dog. As you may remember from last week, I planned to pad the dog's ears, forehead and cheeks and perhaps the front legs. Then I would use mostly stem stitches on top of the padded and non-padded areas. So I started out by padding the dog's cheeks and forehead, put a large X stitch over the area above the nose followed by a few horizontal stitches, then tent stitched its chest and front legs. 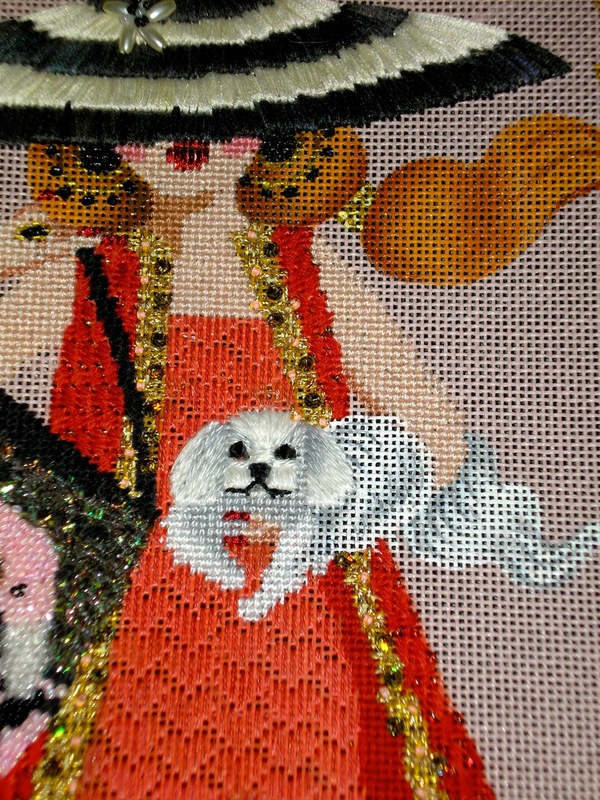 You can see all that above plus I outlined the dog's ears 2/3 of the way around with stem stitches. All of this was done with white perle cotton except for the gray tent stitches which were done in gray perle cotton. I started to feel uneasy about the tent stitched legs and chest (after all, it's going to be difficult to stitch through a layer of tent stitches), so I left that area alone and stitched horizontal stitches across the cheeks and vertical stitches across the forehead with my Silk/Cashmere. Traditionally if you pad an area, the next layer is done perpendicular to the first, hence the orientation of my second layers. 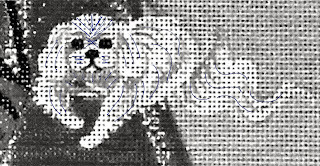 I added more horizontal layers over the area just above the dog's little black nose, which isn't traditional, but that seemed to work well. In the photo above you see all that finished, plus I've stem stitched the ears, working the stitches to match the direction of my black and white drawing but covering the stem stitched edge of the ears. Those stem stitches lift the edges of the ears slightly. Once I had all that done, it was time to stem stitch the front legs, then the dog's body and tail. I switched to a crewel needle to do the legs as the sharp tip makes it easier to stitch through the underlying tent stitches. I omitted the tent stitches from the stitch guide, by the way. I can't see that adding or omitting them makes much difference, but sometimes you don't know this until you try it. Next I added two black Swarovski bicone beads for the eyes and three little stitches in black Petite Very Velvet for the nose. Those PVV stitches were a long horizontal stitch at the top of the nose with a shorter horizontal stitch under that, then a vertical very short stitch under the top two stitches, making a T shape. With two plies of black Splendor silk floss, I stem stitched the mouth. The mouth is better but it still seems to be pulled down on the right side. Checking the canvas under my magnifier, I discovered that this was actually a bit of the black painted mouth showing, so I covered it with a short horizontal white stitch topped with a white tent stitch. When the black paint was hidden, this is the mouth I ended up with. When it comes to the eyes, nose and mount on your canvas, it does take a bit of work to get the expression just right but all that effort is worth it. Those of you with sharp eyes will have noticed that in the mouth photos I haven't stitched the dog's body but when you are trying to explain things, sometimes the photos are out of order. Sorry! The order in which one does things in a stitch guide are not always the order in which they are originally stitched. Your stitch guide author tries to figure out the easiest way to do things, so sometimes the photos we take as we work on a model are a bit out of order. But follow what the guide says and you will have the benefit of working the most efficient and easiest way instead of following what we did and discovering--just like the stitch guide writer did!--that it wasn't the best way of working. This is getting a bit long so let's finish it up tomorrow, ok? © Copyright December 19, 2015 Jane M. Wood. All rights reserved. Tricia Nguyen of Thistle Threads talks about the tour of the United Kingdom she organized to see various 17th Century caskets in castles and museums all over England and Scotland. If you are interested in reproduction embroidery, history or just travel, you'll want to read this. Thanks, Tricia! Tricia is taking a break for Christmas but will return with more about this fabulous tour shortly. I'll summarize everything in Part Two once she posts all about the trip. © Copyright November 7, 2015 Jane M. Wood. All rights reserved. Even though Christmas is in our rear view mirror now, I thought you'd like to see the traditional Christmas ornament exchange among the staff at Pocket Full of Stitches. Mary Agnes just heard that Clara Wells is no longer going to design needlepoint purse canvases due to the problems finding a skilled finisher. MA is stocking up on these lovely designs because before long they will be no more. It's a real shame. Thanks for letting us know, MA! © Copyright December 26, 2015 Jane M. Wood. All rights reserved. © Copyright December 8, 2015 Jane M. Wood. All rights reserved. Tricia Nguyen uses and sells slate frames for her reproduction embroidery business, so I was intrigued when she mentioned Access Commodities' essay on the history of slate frames. I've not used slate frames myself as I don't like stitching on drum-tight needlepoint canvas but it is important for some types of needlework and the history is fascinating. Here is the direct link to the essay. Access Commodities sells wonderful threads and other supplies for the needleworker as well as slate frames. You can also order custom made and painted slate frames from Diamond K Folk Art. You wouldn't believe the variety of painted frames Rachel of Diamond K has made! The tools we use are so vital to our work that it is important to know more about them and to honor their usefulness. Merry Christmas to all stitchers and a Happy New Year to their tools! © Copyright December 10, 2015 Jane M. Wood. All rights reserved. 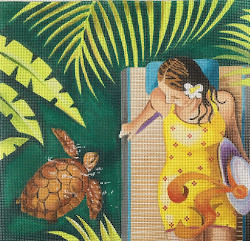 I haven't read Lea Wait's needlepoint/Maine mysteries yet (a third is just out this month) but if you have or if you are a mystery fan, you will want to read Janet Perry's interview with the author. Here is the author's website so you can read more about her and her other mysteries. UPDATE: Lea has added a bibliography of her source material about historical needlepoint to her website. Have fun tracking down the sources. Amy Bunger's latest newsletter has some great tips on staying healthy as you stitch. © Copyright December 2, 2015 Jane M. Wood. All rights reserved. Sue Dulle strikes out on an adventure to discover how best to stitch the "feathers" on a shuttlecock. Not being a Kansas City native, I have no idea why this badminton design is related to Sue's city, but she did a wonderful job bringing it to life. Once again, here is my Leigh Designs canvas of the Miami Gold Digger, with the little dog I plan to needle paint. Note that the animal is semi-realistic and that it isn't too large. For your first needle painting attempt, you probably should start small. This canvas is 18 count and the dog itself is approximately two inches tall and a bit over three inches long at its widest point. Once you have picked a canvas with an animal you want to needle paint, then it is time to take a careful look at the canvas and start planning. The best way to do this is to copy the canvas animal in black and white. 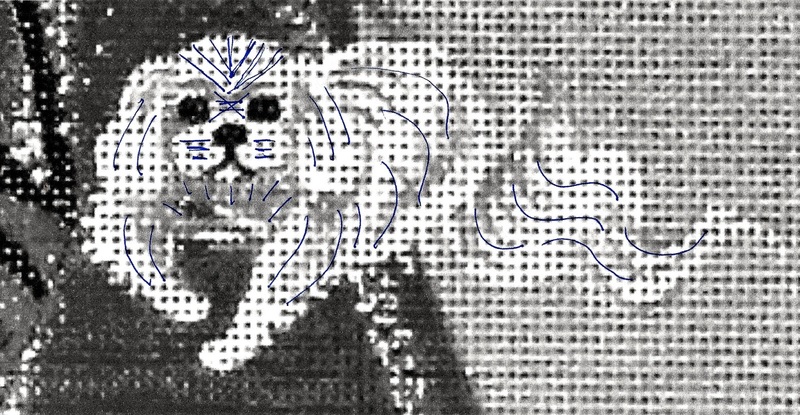 If you look carefully at the dog in the black and white version, you can see the shading lines that Leigh Designs painted on it. These lines are what you will be trying to reproduce in your needle painting. But before you go any further, you need to take a good luck at what the dog is made up of. 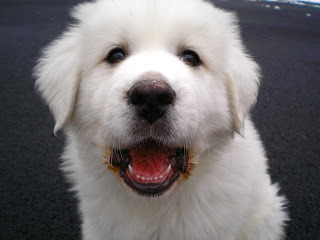 In the photo, the dog has large ears, chubby cheeks, prominent eyes and nose and forehead, front paws clearly defined and a tail. The rear end is much less defined as the rear legs and body are tucked under Mia's arm. All this means that you will want some parts of the dog to stand out and some parts to be less prominent. I like to make things more prominent with padding but there are other ways to do this. You can use beads and bright colors, too. With a white and gray dog, bright colors are out, so I planned to use padding on the cheeks, forehead and ears and to add beads for the eyes. I am going to use stem stitches for the bulk of the dog's body, with a few straight and slanting lines where needed. To help me keep the fur look accurate, I drew pencil lines on my black and white copy of the part of my canvas with the dog. You do this by imagining that you are petting or brushing the fur with the pencil. If you use a pencil, you can erase and redraw the lines until you are satisfied. This is what I ended up with. Note that my marks are in blue ink so they are visible to you. Note that things change as you stitch. You may not end up with fur that flows exactly this way but at least you have a plan. Next time we'll talk about the various areas I stitched and how my plan changed over time. © Copyright December 17, 2015 Jane M. Wood. All rights reserved. Stitch By Stitch's blog has a fun pictorial essay on stitching Christmas trees that is full of ideas for stitches to use on them. There's a stitch for every style of Christmas tree! This time of the year all the great holiday ornaments folks have displayed will tempt us to purchase a Santa canvas to stitch for the 2016 holidays. Then we are faced with the task of coming up with a great beard stitch. One of the beard masters is Janet Zigler Casey, who teaches a very popular line of holiday ornaments. I thought you'd like to see all her beards. Click on each thumbnail portrait to get a better look. If you stitch a lot of Santa Clauses and don't already own Diana Bosworth's little booklet Beards I Have Known, put it on your Christmas wish list. It is full of great ideas for stitches and threads to make fabulous beards. Diana herself is another beard expert. Check out the Petei Santas at the French Knot in Texas, most of which Diana stitched! © Copyright December 7, 2015 Jane M. Wood. All rights reserved. Liz Morrow of LizArt decided to make an original Bargello design as a Christmas present for good friends. And of course there were issues such as finding the right background, running out of thread that is discontinued, etc. But you wouldn't know it from how this turned out. The moral is that everyone, even great designers like Liz, run into problems as they stitch. Personally, I do my best work when overcoming these problems, so keep at it. Nothing runs smoothly all the time, after all. UPDATE: Here is the finished pillow. It is magnificent! © Copyright December 4, 2015 Jane M. Wood. All rights reserved. I haven't paid a lot of attention to DMC's new Common Threads site but it does have some fabulous gifts for stitchers. They have two styles of wooden sewing boxes, although I have no idea why they are only offered in washed-out blue-gray. ...and cute DMC-themed pins, either the skeins shown or two card spools shown at the bottom of the page. If you want something to stitch fast, there are mini stockings, although they really are geared towards cross stitchers. Regardless, it's fun to browse all the styles. Needlework Unlimited in Minneapolis posted about how much it helps their bottom line if you pay by cash or check instead of credit card. It's something to think about, particularly if you are purchasing something for less than $25. © Copyright December 3, 2015 Jane M. Wood. All rights reserved. Doris of Needlepoint Gallery & More just sent me wonderful photographs of finishing she did for a customer. She wanted to know if I could help identify the designer for her as her customer did such a fabulous job --check out those beaded flames!-- other customers want to order this Menorah design, too. With a little help from the nice folks at Facebook's Needlepoint Nation, we found the designer--Princess and Me! Here's the link to Doris' shop, by the way. Thanks for sharing the wonderful finishing and the fabulous stitching, Doris! There are only a few stitches used in needle painting: long and short, satin stitch, split stitch and stem stitch. For your convenience I've found the best online diagrams of each so you have these references at hand. Most of the stitch diagrams I've found are for embroidery so the ground material is fabric, not needlepoint canvas. This makes it a little harder to come up and go down where you should since the grid of needlepoint canvas dictates where your needle can go down. To counteract this, simply use a sharp needle like a crewel needle* instead of the blunt tapestry needles we normally use. This is a nice basic video about how to do long and short. Easy-peasy! Mary Corbet does a fabulous satin stitch video here. She is padding the area first, which comes in very useful for slightly raised areas like dog noses, but this isn't necessary for satin stitches. 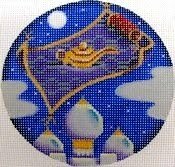 The outlining she does is also very helpful to create a lovely edge for the area to be covered in satin stitches but this isn't always necessary for needlepoint. Another simple stitch, split stitch can be worked with the needle coming up through the previous stitch, or with the needle going down into the previous stitch. It is easier to know where to split the previous stitch if you go down into it, but the preferred way is to come up through the stitch. The end result looks better. So learn to do it by feel from the back and you'll be happier with the look. Stem stitch is a lot like split stitch and its cousin, outline stitch. It's not too hard, either. I like to do rows of stem stitch to fill an area, packing them in as tightly as possible, and varying the length of the first stitch of a row so that the area where you come up and go down for each stitch doesn't line up across the rows even though almost all the stitches are about the same length. I'd like to emphasize that you won't use all of these stitches to do needle painting. It's more typical that only 2-3 of them are used on a piece. But I wanted to put everything in one place as a reference for the tutorial I'm building. I'll add each posting to the "Needle Painting on Needlepoint Canvas Tutorial" tab as they go live. *Donna posted in the comments she uses Bohin's chenille needles for needle painting. Personally I often use beading needles, since they are sharp and I have a nice supply of them. Whatever works for you is fine so see what you have put away or what your favorite shop has a nice supply of in a small sharp needle that will pierce the needlepoint canvas threads. © Copyright November 29, 2015 Jane M. Wood. All rights reserved. 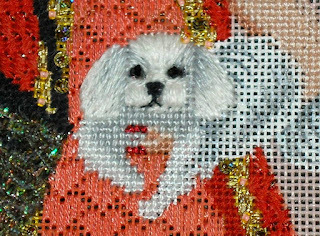 Traditionally, needle painting is done with silk or cotton floss, but for my little dog, I'm using Gloriana's Cashmere/Silk floss. This is a blend of cashmere and silk available in limited colors from Gloriana in 6 yard skeins. I'm using "Silver Fox" which is a light gray and "Soft White" which is white. If you want to try needle painting yourself, I recommend you use either cotton or silk floss, whatever you have at hand in the colors of your animal. Cashmere/Silk is rather expensive for a beginner to play with, although you can't beat the luxurious sheen and softness. It also only comes in a few colors: black, white, gray and brown. By the way, one strand of Cashmere/Silk separates at the cut end into four plies, each of which can be further divided into half, giving you eight plies from one strand. Whatever thread you choose, the ability to ply the thread is important to get the most realistic shading and definition of fur. If you want a more wooly look, Gloriana has Lorikeet, which is all wool and strandable down to 9 plies. It can be mixed with a ply of cotton or silk floss to add sheen and even more colors. Burmilana is also a decent choice for needle painting, particularly on 13 count. It cannot be plied so it isn't as useful on 18 count unless your animal is less realistic and more cartoonish. However, there is a lovely range of colors and there is also the Heathered Burmilana, which is a sort of tweedy mix of colors. Many other threads will work, but these are my favorites for animal fur. Next time we'll talk about the main stitches we will use. The links to each article on needle painting will go in the tab for the Needle Painting on Needlepoint Canvas Tutorial so you can read them in turn without having to search Blog. Kreinik has just announced a new product: four colors of glow-in-the-dark shoelaces made from Kreinik threads. These honor the life of Charles Austin Kreinik who killed himself last spring, with a portion of each sale to go to organizations that try to help those fighting the demons Charles fought and to help those these unhappy people leave behind when they escape unbearable burdens through suicide. If you are looking for something different for stocking stuffers, I encourage you to purchase some of these. One of my brothers killed himself in 1999 after a twenty-year battle with alcoholism, depression and physical ailments. It's about time we did a little something to help those who are still struggling. Gay Ann Rogers just posted a story of Christmas magic in the life of two stitchers on her home page. No crying! This is a story with a happy ending. © Copyright December 12, 2015 Jane M. Wood. All rights reserved. The newest mystery class from Ruth Schmuff will be Tapestry Fair's "House Hunt." The design is exclusive to Ruth's shop right now. I'll update this article as she stitches it since folks can always order her kits after class starts--or ends! You will love the dinosaur covered director's chair that a customer stitched at Ridgewood! Some little boy is going to be VERY happy! © Copyright November 25, 2015 Jane M. Wood. All rights reserved. Sadly, the owner of Needlewoman East in Falls Church, Virginia posted on Facebook this morning that the shop would be closing this month (December 2015). UPDATE: The shop will be closing for good on Monday, December 14 at 6 p.m. This video from Julia M. Usher shows how to create a needlepoint pattern with royal icing on shaped cookies. I thought stitchers who are sighing over how long their stitched needlepoint stocking is taking would enjoy watching this. Many thanks to Michelle for finding this and posting the link on Facebook's Needlepoint group! © Copyright November 30, 2015 Jane M. Wood. All rights reserved. Ridgewood is showing off their finished Twelve Days of Christmas Club on their blog. They are charmers (love those beaded pears!) all stitch-guided by Jennifer. They make a lovely set, so if you are kicking yourself for not stitching anything for your Christmas tree this year, you might want to contact Ridgewood to sign up for this set. Stephanie is adding ribbons to her needlepoint ornaments as she decorates her tree. Jinny's decorating, too! I just love seeing everyone's holiday tree needlepoint ornaments and stockings! Want to Learn Needle Painting? 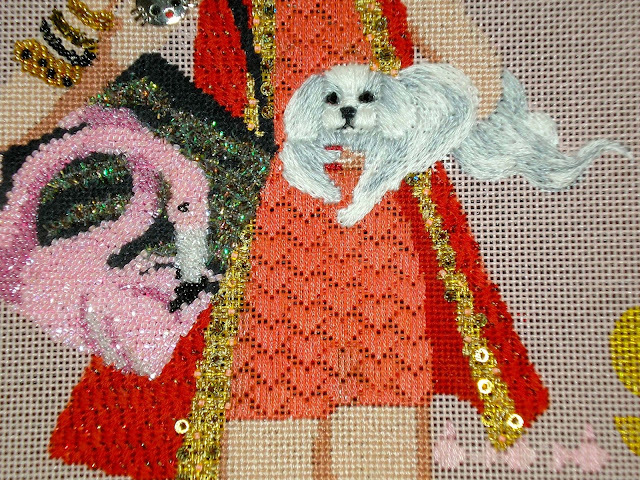 I'm sure regular visitors of Blog have noticed that recently my profile photo at the top of the right hand column has been the little dog from the Miami Gold Digger canvas I'm currently stitching. There's a reason for that--I'm going to use this in a needle painting tutorial. But first, let's talk about what classic needle painting is. 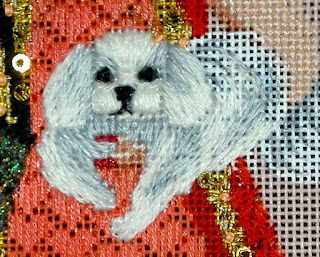 Basically it is creating very realistic animals, usually with one or two plies of cotton floss, using only a limited range of stitches: long and short, stem stitch, split stitch and perhaps a few straight or slightly slanted satin stitches for details like noses and whiskers and claws. Tanja Berlin and Helen M. Stevens are masters of this technique. Berlin Embroidery sells kits to reproduce her original designs. If you head to her website you can see them here. Even more importantly, Tanja has posted examples of her instructions for various items: birds, animals and flowers. Click on any of her examples and you will see diagrams for which colors to use where, diagrams that show the direction of the stitches you will be using and diagrams that tell you what order to stitch the animal parts in. She uses long and short stitch for most of her fur, feathers and flower petals with 1-2 plies of cotton floss. Helen Stevens' website isn't quite as detailed (she teaches, lectures and writes books on her techniques) but the photos are knockouts! She uses the same stitches as Tanja but adds various other stitches for special areas like wings. She also tends to use silk flosses for her designs. Be impressed but don't worry--this isn't nearly as hard as it looks. All you need is patience and to observe dogs to see how their fur lies since we don't want to stitch Campanita's ears so the fur sticks out in an unrealistic way. Don't own a dog? Not to worry--Watson will pose for us. Stay tuned for an orientation to the threads and stitches we'll be using. 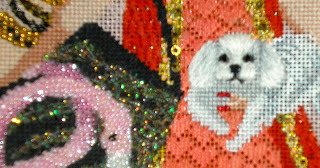 I will add article links to a new tab called "Needle Painting on Needlepoint Canvas Tuturial" as they go live. Which will be when I have time, this being the holidays. ...plus Vicky has others to browse as you select something to stitch for next year. © Copyright December 6, 2015 Jane M. Wood. All rights reserved. I don't usually post links to trunk shows as I don't like to encourage folks to only shop sales instead of finding and then supporting a great local shop. But because Ridgewood is showcasing Heidi's designs, I am making an exception. Designs By Heidi does wonderful painted canvases, full of detail and originality but she doesn't have a website so you won't see many of her things online. Take this opportunity to enjoy her work and perhaps place an order for something special. Heidi does have photos of her designs on Flickr. You may not be able to see this if you don't log into Flickr with your Yahoo email account but it shows things you don't see on Ridgewood's blog entries, so try it. If you find something you want, you can email Heidi at jonrheidir@gmail.com to order. UPDATE: Needle Bug posted a photo album of Heidi designs on their Facebook page. UPDATE #2: Bloomin' Stitches now stocks Heidi canvases. The National Needlearts Association (TNNA) has a needle arts mentoring program, which I just discovered existed from reading Mr. Squiggee's blog. You can learn more about the program, how to become a sponsor or donor and how to set up such a program for kids in your area from their website. Wouldn't this be a great Christmas gift to your community, particularly if your local guild chapter participated? © Copyright December 5, 2015 Jane M. Wood. All rights reserved. Whether you are Christian or not, I thought you'd enjoy looking at photos and a video about the needlepoint decorations at Saint Michael and All Angels' Episcopal Church in Denver. Colorado. They have a lot of photographs of church events on Facebook but this is the only stitching photo there I could find. On the other hand, there is a nice video of the church interior that showcases their Christmas decor. The website has information about St. Clare's Needlepoint Guild which has created the needlepoint decorations for the church. The church has a Christmas tea in December each year that showcases their unique stitching if you happen to live in the area. The 3R Ornament (the Rs stand for reduce, recycle and reuse) is a fun project described in full on the EAC blog. It's a great way to use up leftover supplies from your last project or two and will make wonderful presents or Christmas ornaments for next year. Have fun, be creative as you do your own 3Rs! Two's Company is holding an ugly sweater contest at the shop for Christmas and they want your help choosing the winners. Please email or text your vote for a) the Ugliest Sweater and b) Your Favorite Sweater to the contacts in this posting of the contestants. If you click on the first sweater, you'll see each design better and can read each design's title so you can vote for the ones you think should win easily without having to describe it. Kimberly shows how a sketch is turned into a hand painted needlepoint canvas. If birds are your thing, you'll really love this! The design is called "Little Dancer" and you can pick it up from Ruth Schmuff's website. Here's the companion piece Kimberly mentioned. It's called "Emma's Little Bird," and Ruth stitched it in one of her famous mystery classes. © Copyright November 28, 2015 Jane M. Wood. All rights reserved. Needlepoint Land's owner, Erin, is having a bad day. UPDATE: A clever Blog reader used Web Cache to allow us to see the now password protected posting. Thanks, Anon! You win the Smart Cookie Award for today! If you have a little extra cash, how about visiting Erin's online store and buying something? © Copyright November 27, 2015 Jane M. Wood. All rights reserved. Dena of Kreinik profiles Sew Much Fun's dimensional animals on the Mr. X Stitch page. You'll learn about the two sisters who run Sew Much Fun, see many finished models of their dimensional stuffed animals, and find links to their online shop.